The Remount Depot Buildings situated Hall Lane, Lathom. Which is well documented in this website, whilst also on that of Lathom Park Trust. These remaining buildings are the last indications of an important part of British Military History not only in this area but of the impact of one man’s most reliable ‘friends’ the Horse. Below the Original Remount Depot Camp Entertainments Hut. Attached to which are two former billet huts from the camp. Evidence in one of washbasins, and in the other ‘feet impressions’ of a stove in floorboards with exit hole of chimmney in roof. Local heritage lost forever if replaced by housing. The area lost one iconic image in 2003 with the destruction of its unique Royal Naval Air Station Control Tower on the former WW 2 Air station, now an expanding industrial estate. Above and below one of only 3 remaining Fleet Air Arm Control Towers left in the country in 2004 , heritage being destroyed for development. The Military Heritage of the district is now in danger of losing the last vestige of the Remount Depot. Lathom Parish Council (who’s details are below) would welcome your support, if you believe local history / heritage ought be preserved then add your voice. The Scouts seek to ‘maximise’ a £2 investment made some fifteen years ago, (Rumour has it that it was little over £1, but nowhere near £2 benefit of doubt to Scouts) Sold likely for prestigious housing in a conservation area. The ‘overall’ ground area inc existing parking is capable of development for 3/4 prestigious houses, nice maximisation indeed! Below the letter from Lathom Parish Chairman to the parishoners of Lathom. In turn this letter has been supported by LBMHS. Local press coverage in the Ormskirk Advertiser. SOME PICTURES OF PAST EVENTS BELOW. 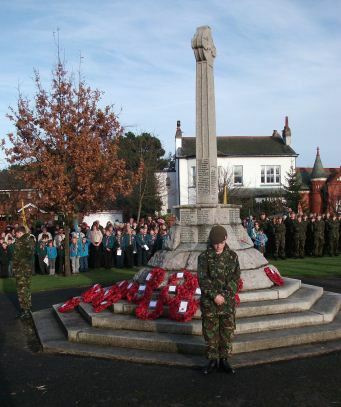 Richard Houghton and Lawrence Critchley gave a talk to pupils of Lordsgate Township Primary school about the meaning of wearing poppy at remembrance time . 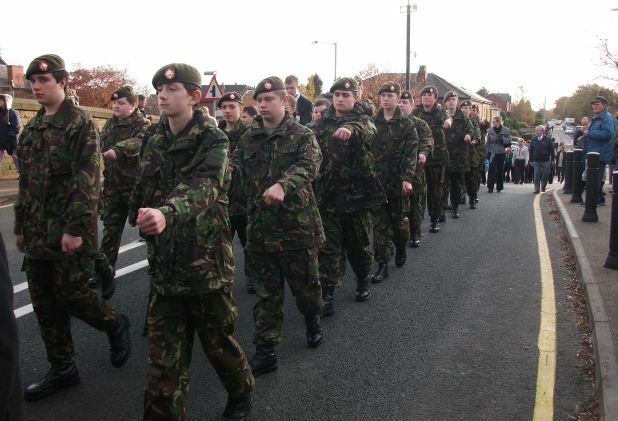 The society do this each year at local schools leading up to poppy day. 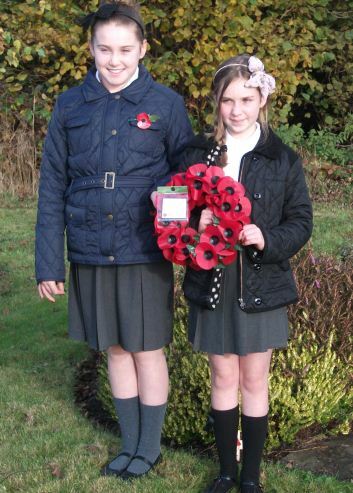 They are obviously not old enough to remember the horrors of WW2, but two pupils from Lordsgate Primary School, Shawn Flood and (right) Amy Harrison, took their places with pride as the village remembered the fallen yesterday with two special services. The girl’s original school was demolished in 1941 to build the local air base and re built at its present location. Click this bar to view the original image of 662x415px. 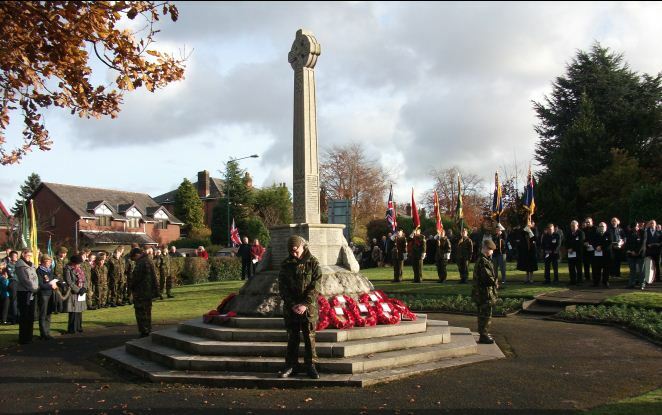 Services at the HMS Ringtail memorial on Pippin St. and then in Burscough village attracted hundreds of folk including local Mayor Paul Greenall, and members of Burscough PC.